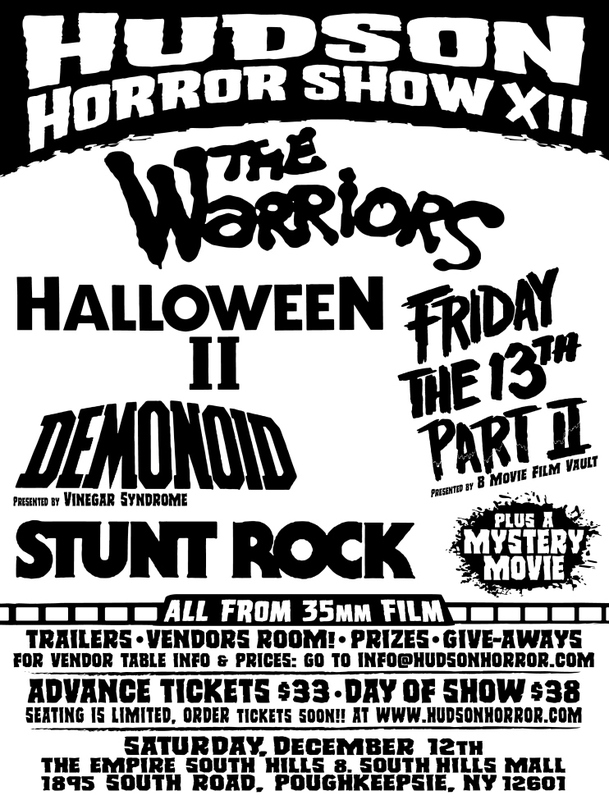 THE B-MOVIE NEWS VAULT: HUDSON HORROR SHOW 12 RETURNS TO POUGHKEEPSIE ON DECEMBER 12TH! HUDSON HORROR SHOW 12 RETURNS TO POUGHKEEPSIE ON DECEMBER 12TH! UPDATES: Screening schedule located at the bottom of this post + New event poster revealed! Hudson Horror Show is returning to its stomping grounds at the Empire South Hills 8 on Saturday, December 12th! Their last all-day film fest sold out (in 90 minutes! ), as did their recent double feature at the Alamo Drafthouse), so it's no shocker that the Hudson Horror crew expect another sell-out show this time around! Though twice as many tickets will be available, expect them to be gone within days of availability! Wait what? Did I just say TWICE as many? Yes I did, and that's because all six of the day's films will be screened on TWO SEPARATE SCREENS! You see, Hudson Horror Show has become one of the most highly-anticipated events on the East Coast, and as a result, has outgrown its current home. But the Empire South Hills 8 has been such a great venue that Chris Alo and friends didn't want to take the show elsewhere, so showing films on two screens just seemed to make a whole lot of sense! I'm sure you're super curious about how this is all going to work, and I shall explain, but first (as stated in my Hudson Horror Survival Guide) you need to GET YOUR TICKETS ASAP! To do that, you'll have to visit the official Hudson Horror Show site (www.hudsonhorror.com) on Saturday, October 17th at 11:00 AM EST. When you order, there will be TWO BUTTONS to click on (Theater #1 and Theater #6), so plan accordingly. If you're bringing friends with you, make sure you buy tickets for the same theater! As for the 35mm prints being shown, rest easy knowing that BOTH theaters will be showing the SAME SIX MOVIES, but the lineup on each screen will be different! So while you're gazing at the insanity of DEMONOID, your pals in the other theater will be enjoying the tunes of Sorcery during STUNT ROCK! And while your night may end with HALLOWEEN II, mine could end with Walter Hill's THE WARRIORS. Regardless of which theater you're sitting in, you will see ALL SIX FILMS IN 35MM! Also, start times will be staggered for both theaters: One will kick things off fifteen minutes early, while the second screen will kick things off fifteen minutes later. This is being attempted in the hopes that the snack bar and bathrooms don't get jammed up, since more people will be attending than ever before! I know this is all kind of crazy, but I think it's a solid plan, and hopefully I've explained it clearly enough. 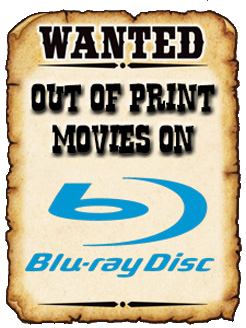 If not, drop me a line at vault_master@bmoviefilmvault.com. And if I don't have the answers, send your inquiries to chris@hudsonhorror.com, and get the facts straight from the horse's mouth! 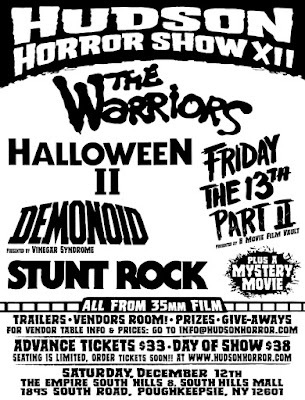 So what is being shown at the 12th edition of Poughkeepsie's famous Hudson Horror Show? I'm glad you asked! 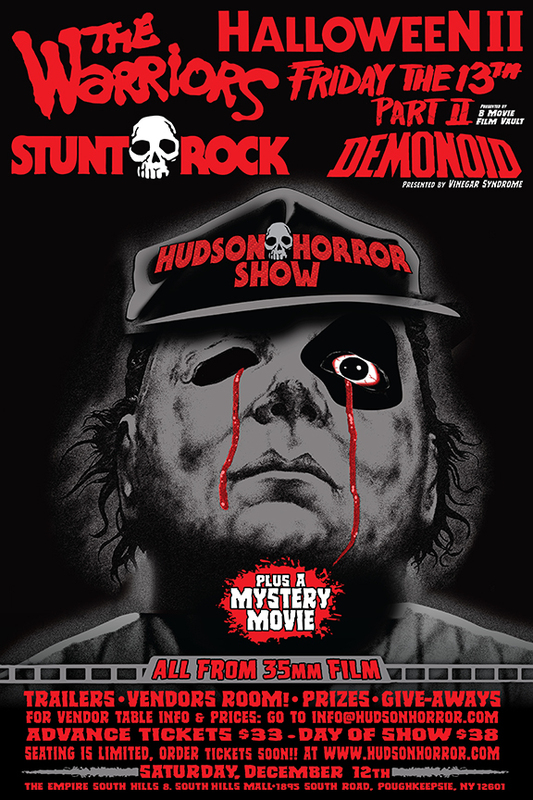 DEMONOID - Presented by Vinegar Syndrome (who will vending at this show, and selling copies of their new DEMONOID blu-ray! ), this 1981 horror flick from Mexico is crazy! After discovering an ancient Satanic temple, miners unleash "Satan's Left Hand" upon the world! The hand possesses people, then kills them when they attempt to have it removed. This movie is hilariously bonkers and should make for a great time! STUNT ROCK - Australian stuntman Grant Page stars as himself in this once lost 80s classic, where he comes to America to do stunts for heavy metal band SORCERY (who did the soundtrack to ROCKTOBER BLOOD)! I've never seen this one before but I'm really looking forward to it! FRIDAY THE 13TH PART 2 - Presented by The B-Movie Film Vault (a.k.a. ME! 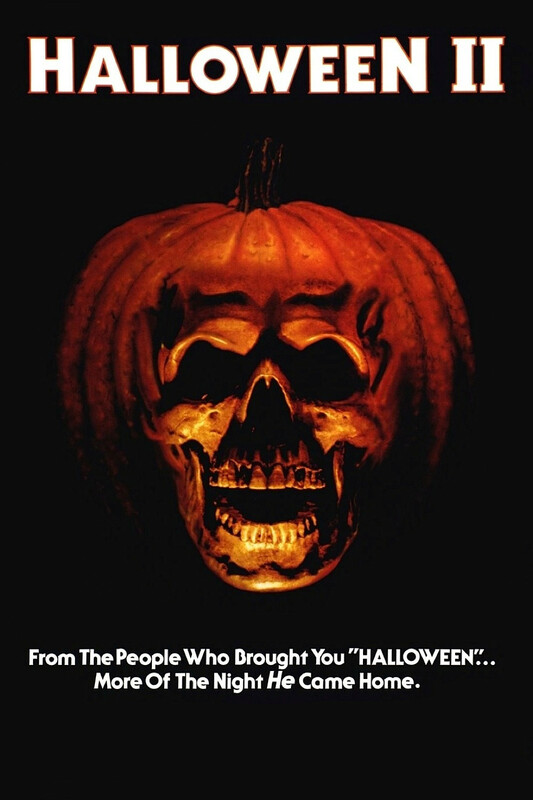 ), this is one of the most important slasher films of the 80s! Years after the events of FRIDAY THE 13TH, a new group of counselors settles in near the ruins of Camp Crystal Lake (now referred to as "Camp Blood"). Despite warnings, the "teens" venture off to the old camp and incur the wrath of the sack-masked Jason Voorhees! This is Jason's big screen debut, and it features one of my fave onscreen deaths! I can't wait to see this with an audience! 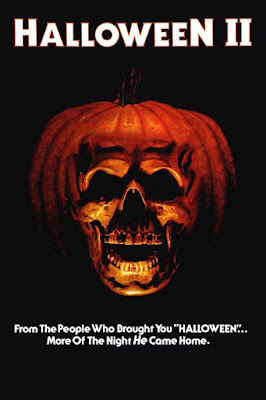 HALLOWEEN II - This sequel picks right up from where the original left off. Laurie Strode (Jamie Lee Curtis), the sole survivor of Michael Myers' killing spree, is taken to the hospital. Meanwhile Sam Loomis (Donald Pleasance) continues to seek out his psychotic mental patient, who is still on the loose and looking to murder Laurie. Why is Michael Myers so intent on murdering Laurie Strode?! See HALLOWEEN II to find out! THE WARRIORS - A gang has to fight their way through the mean streets of New York and back to their home turf on Coney Island when they are framed for the murder of a major gang leader. Finally, I can see the unaltered theatrical cut of Walter Hill's cult classic in 35mm! JOY! THE MYSTERY MOVIE - The mystery movie never fails to deliver the goods, and there's been so many cool ones over the past few years. Will it have vampires or killer animals? Is it a slasher flick? A Horror anthology? You won't know until the projector fires up! As always, each film will be preceded with contests and giveaways, as well as cool 35mm trailer reels, and there will also be plenty of vendors selling toys, DVDs, Blu-rays, posters, clothing, and other collectibles! So get your tickets, put aside some spending money, and save the date! Once again tickets go on sale this coming Saturday (October 17th) at 11:00 AM EST at HudsonHorror.com! Don't miss out! Pre-order your tickets as soon as they become available, and maybe I'll see you in Poughkeepsie in December! Note: Movie times are tentative and subject to change. 10:30 PM - 10:45: Final Break! 10:00 PM - 10:15 PM: Final Break!